Proper maintenance is essential to ensure long life and reliable energy from your stand-by generator unit. P.J. 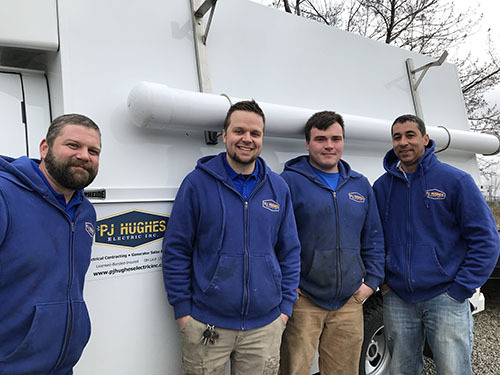 Hughes Electric, Inc. proudly provides this professional service. The manufacturer of your unit recommends that maintenance visits occur twice per year. Now serving Cleveland, Akron, Lorain, Medina, Lake, Wayne, Huron, and Geauga areas. All of our preventative maintenance service programs include parts and labor needed for regular maintenance. Our trained and certified generator maintenance staff will perform the following services on your generator. In addition, any issues with your unit that may need to be repaired, replaced, or upgraded will be reported following our regular maintenance visits. All additional maintenance or repairs, outside of the tasks listed above, will be subject to standard service rates. Click here to download maintenance information and Service Agreement. When the power goes out, we depend on our back-up generator. Thanks to the excellent maintenance program we have with P.J. Hughes, we know we can count on our generator to perform. ~ Mark S.